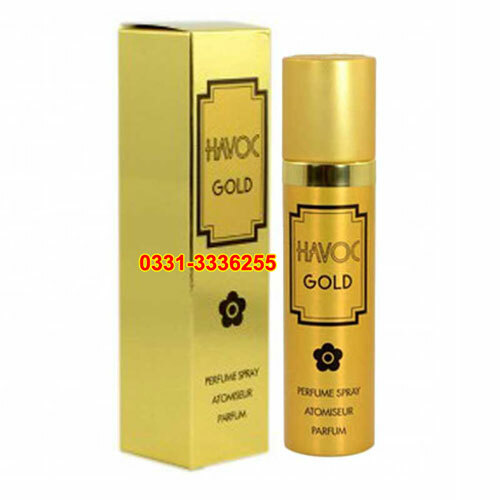 Online Shopping in Pakistan HAVOC Gold Perfume Original 75ML with Free Home Delivery and Payment On Delivery.HAVOC Gold Perfume Original 75ML (Product Code: Havoc) offer by DiscountMall at just ₨1190/- instead of Rs 1500/-, enjoy Fast Shipping with FREE HOME DELIVERY. 100% Original HAVOC Gold Perfume 75ML, Excellent perfume to make your body fresh & germless. Cologne spray with long time stay smell. Havoc is classified as a gorgeous powdery mossy, green, aldehydic chypre with a floral that begins with a tantalizing floral creme broule. It gradually settles down to a really lovely retro mix of green floracy and a faint musk. It is a very rare and hard to find perfume. Havoc Gold, a bottle of 75ml. with a tempting smell.